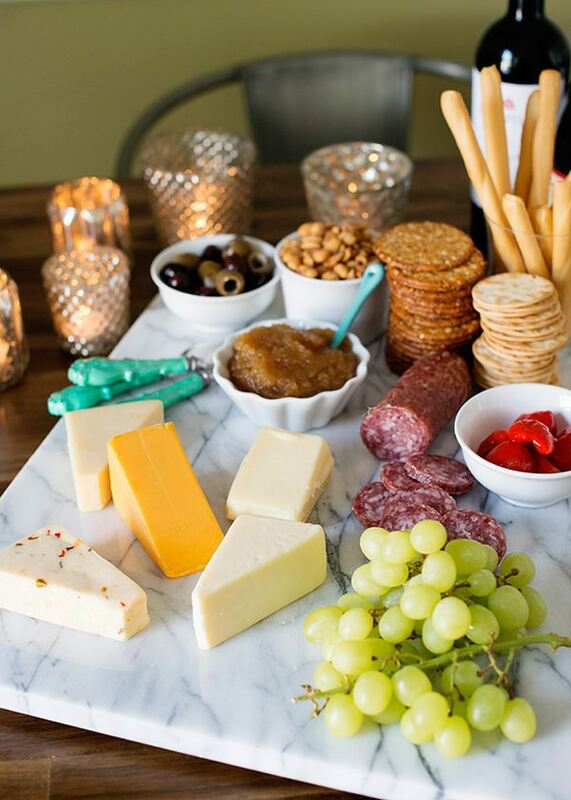 A cheese plate is without a doubt the easiest appetizer going. It’s assembling – not cooking, and that right there is why it always shows up when I have people over for dinner. 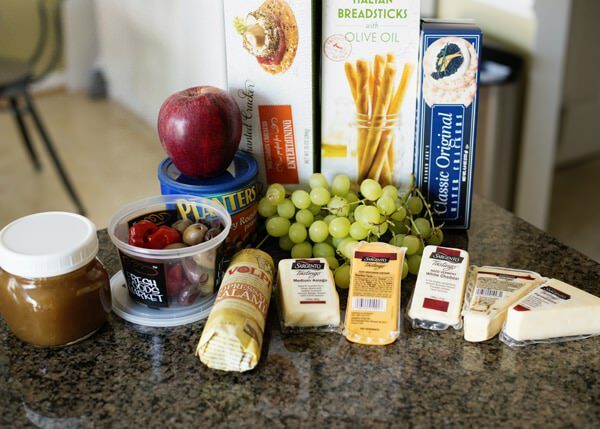 I buy some great cheese, and then 9 times out of 10, I shop my pantry to fill it out. I rarely make the same one twice. I like my cheese plates to have variety. Sharp cheese, mellow, spicy, soft, hard. And then I like to add a few kinds of crackers, nuts, olives, meats, fruits, and a jam or chutney to round it out. Sweet, salty, bitter, crunchy, and soft. They are always interesting and everyone is happy. I am thrilled to be working with Sargento Cheese again this year. I absolutely love working with this company and have loved getting to know their products. 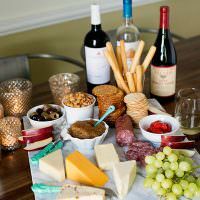 They have recently released Sargento® Tastings™. These blocks of cheese are made for snacking. 8 varieties to choose from, and I love them all. I really like the size of these little blocks of cheese, and that you can try new ones all the time. 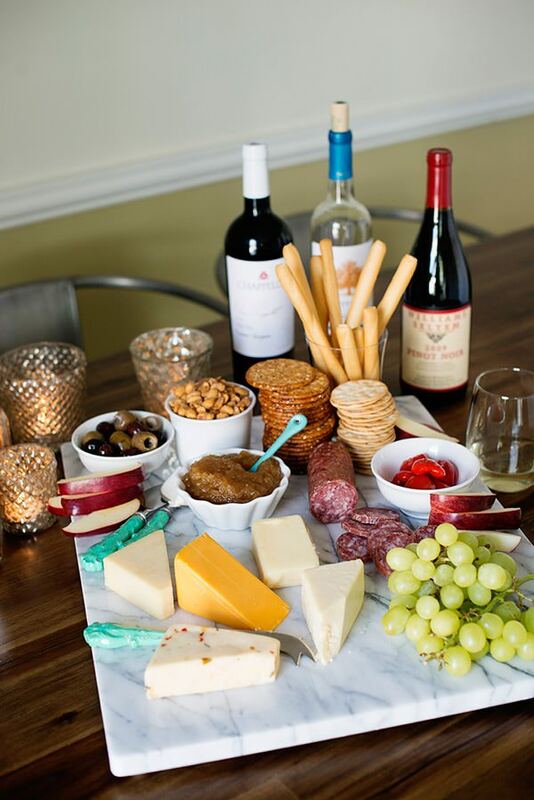 I always have a few cheeses in the fridge, and made this cheese plate one evening when I didn’t feel like making dinner. A glass of wine, and I was perfectly content calling this a meal. I like to keep a few jams, jellies, and butters around to go with my cheese. I love the sweet/savory combination more than anything. 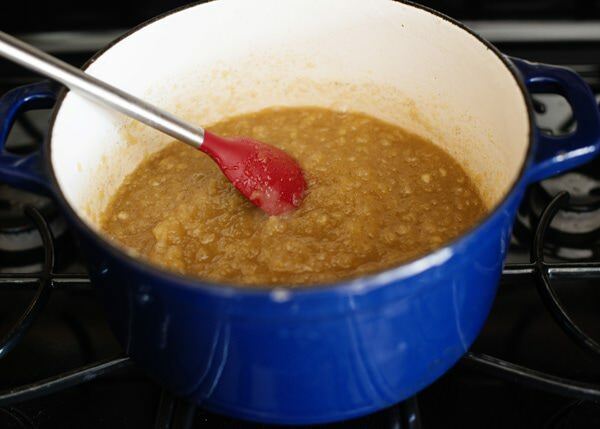 I made this caramel apple butter that I found in Better Homes and Gardens. It is very simple, and while it takes awhile to cook, it is zero effort. I think that this goes so well with the cheddars, a lot like apple pie. So good. I made a half recipe, I wasn’t going to can it, and I only needed a jar or two. We ate one, and I gave the other away. It also makes a great gift. 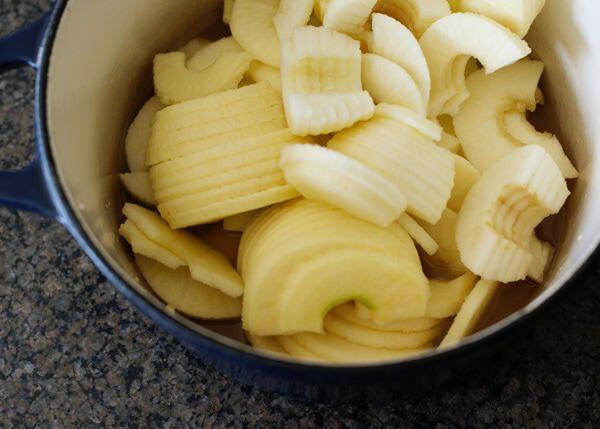 Peel and chop apples. 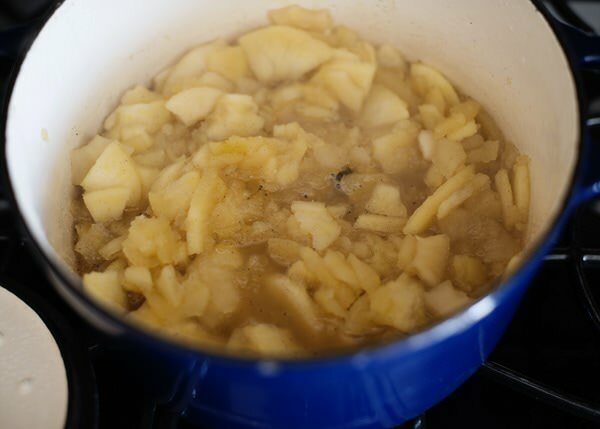 Add to a large Dutch oven or 8 quart pot with apple juice. Add the vanilla seeds and pod to the pot. Bring to a boil, and reduce heat. Simmer, covered, for 30 to 35 minutes or until very tender. Take the vanilla bean out, but save it. 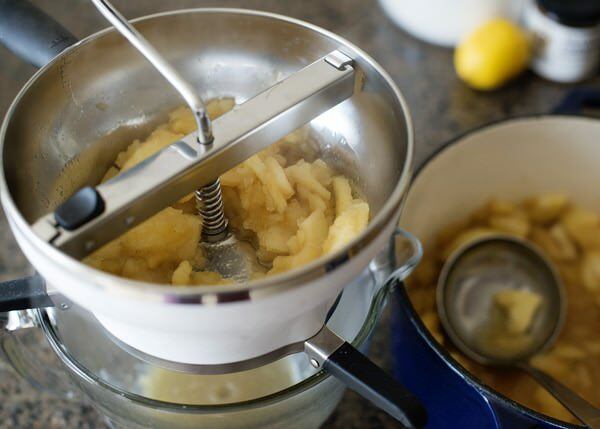 Run the apples through a food mill, blender, or food processor. 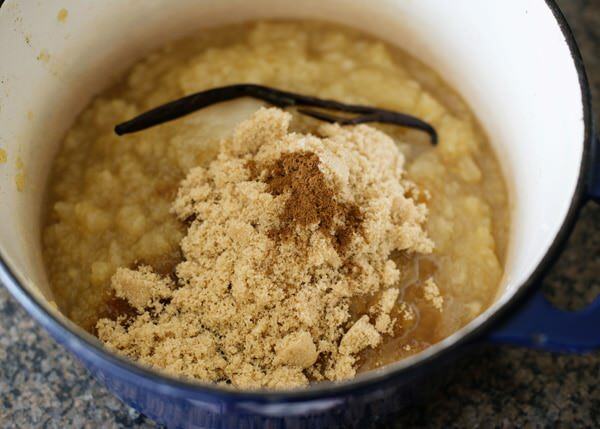 Add the vanilla bean back to the pot and add brown sugar, sugar. lemon juice, lemon juice, and cinnamon. Bring to a boil, and reduce heat. Cook, uncovered for 1 1/2 to 1 3/4 hours, or until the mixture is very thick and the liquid has been cooked out. Take the vanilla pod out. Transfer into 6 half pint jars. You can can this recipe but adding the butter to hot sterilized canning jars, leaving 1/4 inch headspace. Process in boiling water canner for 5 minutes. Peel and chop apples. 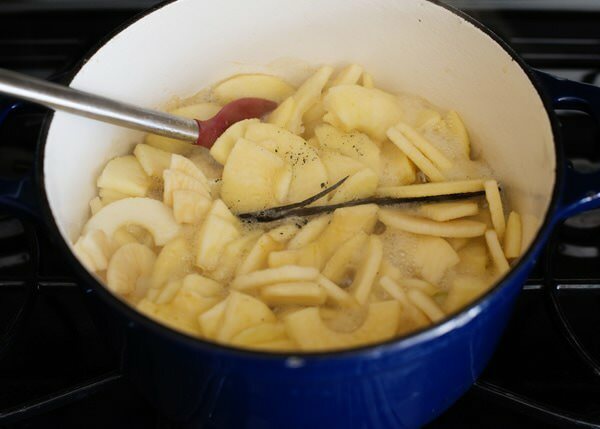 Add to a large Dutch oven or 8 quart pot with apple juice. Add the vanilla seeds and pod to the pot. Add brown sugar, sugar. 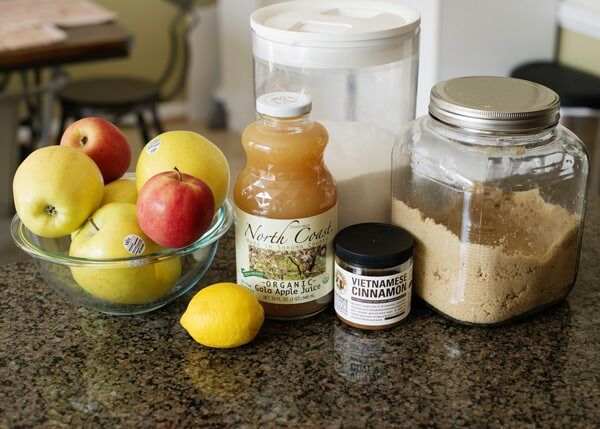 lemon juice, lemon juice, and cinnamon. Bring to a boil, and reduce heat. Cook, uncovered for 1 1/2 to 1 3/4 hours, or until the mixture is very thick and the liquid has been cooked out. Transfer into 6 half pint jars. 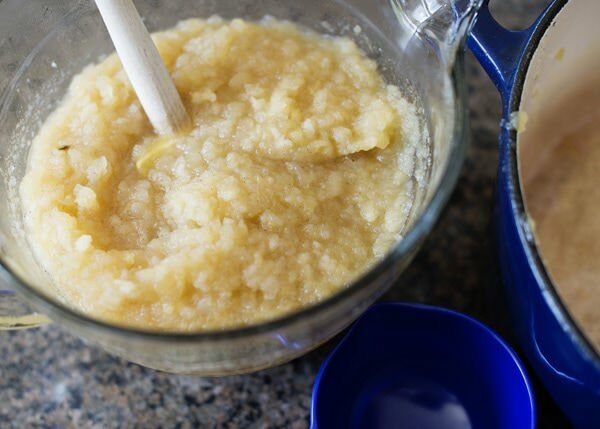 You can can this recipe but adding the butter to hot sterilized canning jars, leaving 1/4 inch headspace. Process in boiling water canner for 5 minutes. 2 teaspoons? At the end after it has cooked down. This looks like a perfect plate! 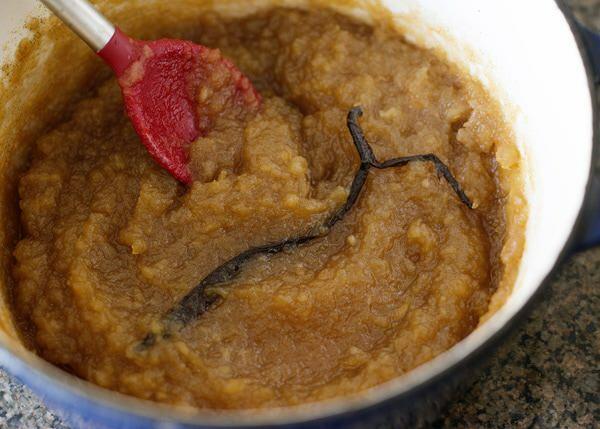 And the caramel apple butter sounds amazing! For canning you say add butter to jars? But don’t specify how much? 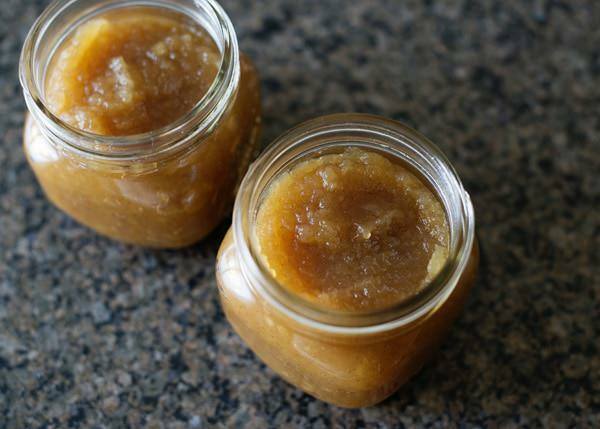 I’ve been looking for a recipe that uses a vanilla bean.Nothing beats the flavor or aroma of a real Vanilla bean..
the apple butter to the jars, not actual butter. What are the names of those crackers – and where did you buy them. I see the photo but can’t seem to make out the names. Thanks. They are the Everything cracker, water crackers and breadsticks from Trader Joe’s. Thanks so much, Bree. I’ll be heading to Trader Joe’s for sure. You’re welcome! I made a MASSIVE cheese tray over the holidays and everything came from TJs.